Arkki has taught architecture for children as long as 25 years. In recent years its operations have expanded in fast pace to different parts of the world. The first Arkki of China was opened in Shenzhen. Zhu Jian Cong shows pictures of impressive European architecture on the laptop to the kids. Many bridges and “The Gherkin”, the Swiss Re Building in the City of London flash by on the screen. Zhu shows a familiar tower and asks if anyone recognizes it. “Eiffel!” Zhang Huang Yu is the first one to shout out. After having looked at famous buildings, Zhu goes to fetch some candies and toothpicks from a shelf. The kids start using them to build a square first, then three-dimensional shapes. “Candy architecture” has been one of Arkki’s methods in Finland for a long time. Now it is being used in Shenzhen of China where Arkki opened its first location in the middle of March. In recent years Arkki has expanded its operations outside Finland in fast pace. In Europe, Arkki operates in Greece and the Czech Republic in addition to Finland, and the first Arkki franchising in Asia opened last year in Vietnam. Now they have opened in China, and the next target is Thailand where Arkki is building its own premises to be completed in June. Arkki teaches children from 4 to 12 years of age. In the photo is Zhou Zhi Xiao. In China, Arkki’s major partners are Vanhang Sailing and Meisha Education. They are part of Vanke Group, the leading city and countryside development service provider in China. The purpose is to expand operations quickly in China after early success. “Our objective is to open one more location in Shenzhen this year and five more during the next three years. In addition to Shenzhen, Beijing and Shanghai offer good possibilities to an organization like Arkki,” says Qingfeng Li, Arkki’s project director in China. Cooperation has been in development for years. Arkki founder and principal Pihla Meskanen has given lectures in China, many Chinese children have participated Arkki’s summer camps, Arkki has received visibility in local media, and they have participated in an internationalization project of Tekes by which they gained plenty of contacts. When a suitable partner was found, the contract was achieved in a few months. For the rest of South-East Asia, Arkki International has produced a franchising deal with Viet Motion into as many as ten countries. “We have already found potential cooperation partners in Indonesia and Malaysia,” Meskanen says. Architectural student Zhu Jian Cong is one of the Arkki teachers in Shenzhen. In China, kids’ activities are a competitive business and expensive to the parents. Arkki operates in shiny new premises in the so called Educational Mall. It is like a large shopping centre, but the premises are used by companies to provide various leisure-time activities. On the day of the interview, balls roll on a green felt in the golf centre and kids show their fencing skills on the aisle, marketing the local fencing school. Calligraphy is one of the subjects taught in the centre. The building also houses another school that teaches art and architecture. There has been plenty of interest towards Arkki. “During the two first weekends, 200 parents with kids learned about our operations,” Qingfeng says. There is lots of competition in China, and parents demand a lot from their children. As they pay a large price for the activities, they also demand a lot from the organizing companies. Parents often want to see measurable results for the amount of increased creativity, for example. “In China everything is performance-focused, and parents consider carefully where to place their children. Hobbies and activities are considered more like extra studies, compared to Finland. We are trying to send through a message that at Arkki we study important subjects but that the results cannot be measured after just a few lessons,” says Jere Keskinen. He has worked at Arkki in China for a couple of months training teachers and teaching kids’ groups himself. 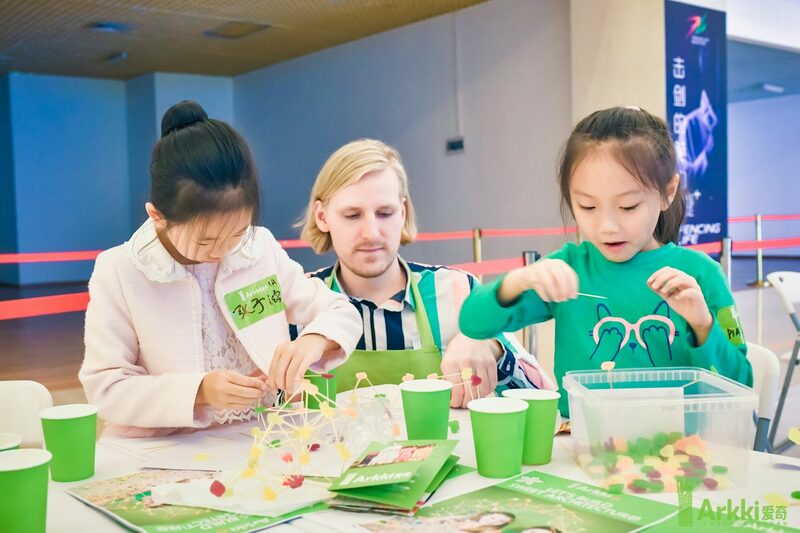 In Finland the motto is “Play, Create, Succeed” but in China, Arkki’s slogan is “Creative Education for Future Innovators”. 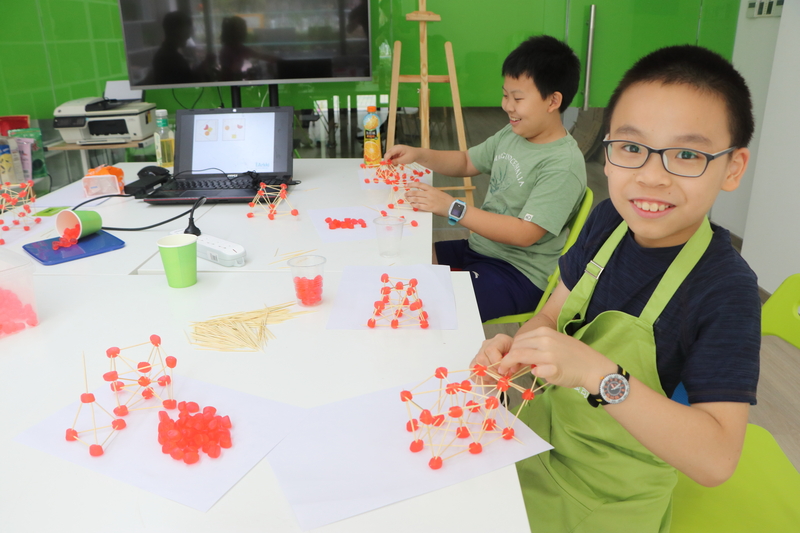 Zhang Huang Yu and Zhao Yong Jia create candy architecture during a Saturday workshop. 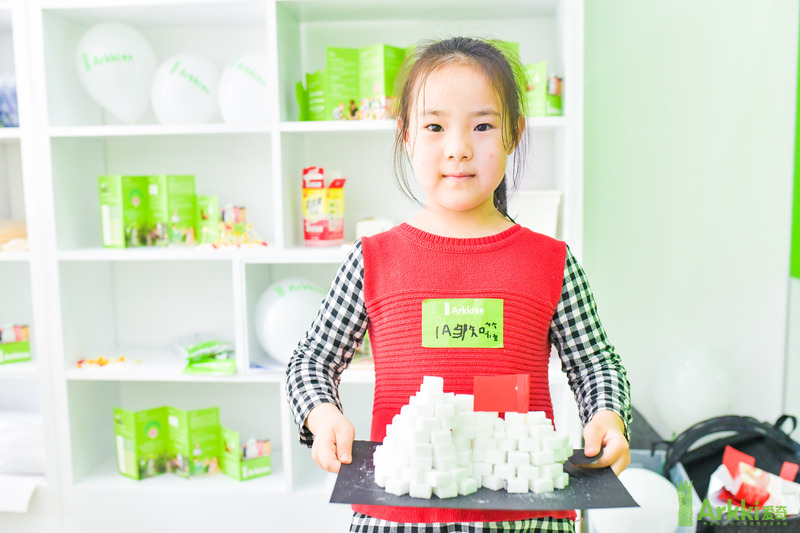 Arkki teaches 4 to 12-year-olds in China. Children of this age group have not yet been tightly formalized by the education system and are therefore not under huge performance pressure like older pupils. They still have courage to create freely. In Finland, Arkki traditionally addresses social and environmental questions by ways of imaginative play, interaction and engagement. In China, the Arkki teachers seem to have adapted the principle well. Zhu Jian Cong shows the kids how to create candy architecture and seems as excited as they are. If the kids are happy after a lesson at Arkki, so are their parents. “One of the parents was very happy to have their child concentrate on one thing for an hour and a half, unlike in school. Parents also say that after Arkki their children create projects at home, too, on pretty much everything,” says Keskinen.